There just isn't any defense against pure and simple stupidity. Whilst clearing out a section of my sewing room last night, I came across a big, ol' bag from Joann's. 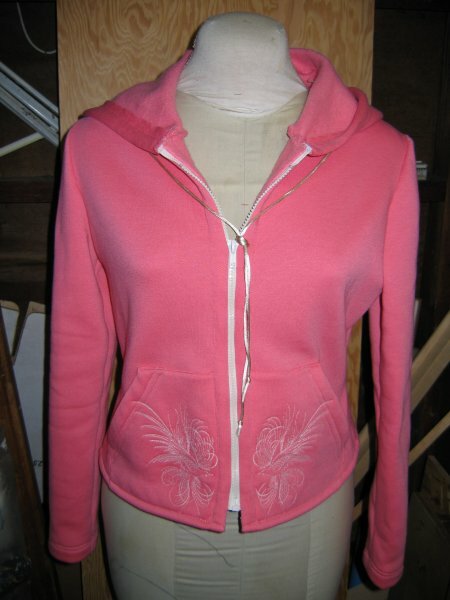 I couldn't remember what on earth it could be and was chagrined to discover some sweatshirt fleece to make 2 hoodies (one for me, one for DD#2) and some voile-type fabric to make 2 summer skirts for the aforementioned daughter. I did a test stitch out .. looks *really* nice, DD#2 likes it. Stitch the bird out on the first pocket .. wow! it turned out exceptionally nice ... I'm pleased with myself. On the first pocket I have the bird facing the center of the hoodie. 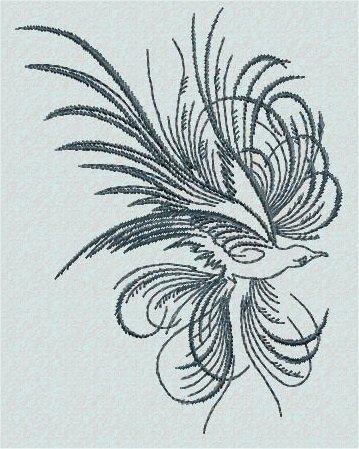 Therefore, the bird on the other pocket needs to be mirrored so that it will also face the center front. Not a problem ... I have an embroidery program that will allow me to do that. After I actually figured out which menu items really *did* the mirroring [small smile], I saved the reversed bird and printed out a template (so I could center the design on the pocket). Working on the other pocket, I hoop my stablizer, hit it with spray baste and center the pocket (using the reversed template) on the stablizer. Attach the hoop to my embroidery machine and hit the 'start' button. Since the first pocket stitched out so well, I didn't monitor the stitching as it was being done (can you hear the ominous music?). The design was about 2/3rds the way through when I actually LOOKED at the stitching. OH MY GOODNESS. The bird is facing the *same way as the first bird*!!! How the *heck* did that happen? Well .... idiot here (that would be me) didn't actually TRANSFER the reversed design to the compact flash card (and hence to the embroidery machine). Sure, I saved the reversed design .. but that was on my computer's hard drive. It's kinda difficult for my machine to stitch out a design when said design on only on the computer. aaarrrggghhh! Not only that, but I couldn't cut out a new replacement pocket because the scraps I had were just that .. scraps .. and not a piece big enough for the pocket. I had bought the fabric long enough ago that Joann's no longer had it in the store. aaarrrgghhh! That left the only possible solution ... pick out the design. aaarrrggghhhh! About 2 hours later, I was back to square one. 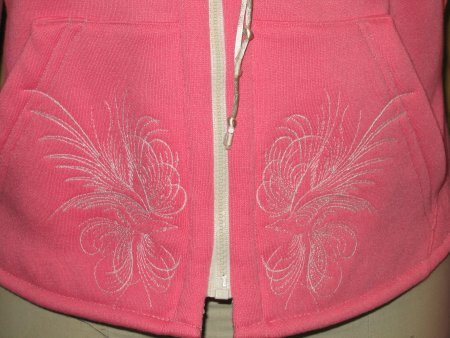 Fortunately, sweatshirt fleece is very forgiving and you can't even tell that there used to be stitching there. So, now I make SURE to transfer the reversed design to my compact flash card. Make sure the pocket is still centered in the hoop. Fire up the embroidery machine and start stitching .. again. The bird is now stitching out in the correct direction and I am pleased. So, off to check on my email .. but wait!!! (do you hear more ominous music?) the "BEEP" that signals the end of stitching came a little too soon. Whatever could the problem be?? Looking at the stitchout, I discover that the BOBBIN THREAD HAD RUN OUT about 2/3rds the way thru the design. AAAARRRRRGGHHHHH! [hear the sounds of me thunking my head on the wall] Since my embroidery machine isn't top of the line, it doesn't have a low-bobbin indicator nor does it immediately stop when it runs out of bobbin thread .. oh no, no ,no! .. it just merrily keeps on stitching. [sigh] Fortunately I am able to back up the machine to the point where the embroidery stitching stopped, put in a new, fully-loaded bobbin and continue stitching. Also fortunately, just cuz I'm *so special* [sarcasm mode: off], I was able to line up exactly where the previous stitching ended and start from that point. The second pocket is now complete .. with the bird fully stitched out and facing in the correct direction. I'm really hoping that I don't have any MORE mishaps and can finish the hoodie *tonight*.